On skates Leo had the speed and grace of a gazelle. It was 1945, and at age sixteen, Leo was invited to play senior hockey with the Grande Prairie Key Club along with young WWII veterans. His hockey heroes included Roy Wright, Charlie Turner, Max Henning, Bob Card, Cliff Wright and Bill Bessent. At that time senior hockey consisted of four local teams: D- Company, Key Club, the RCAF, and the Army Signal Corps. In 1947 the old Wapiti Arena was condemned but by then Leo was a sought-after hockey prodigy and moved to Central Alberta where he played for the Olds Elks, Didsbury Ramblers and the Carstairs Seniors. By 1950 the Memorial Arena was completed and Leo returned home to Grande Prairie where two senior teams, D-Company and the Legion, were intense rivals. Leo played first with D-Company, then with the Red Devils, an amalgamation of the Legion and D-Company. In 1954 the Red Devils were re-named the Athletics. Leo was Captain of the Athletics for several years, coach in 57 and in 58 under his leadership they won the South Peace Hockey League (SPHL). Leo played the game until 1960 when a chronic back injury forced his retirement. Leo was an entertaining hockey player but his legacy to the sport was not as a player. He is remembered and admired mostly for his contribution to officiating. In 1964 Leo helped to introduce a three-man referee system: one referee and two linesmen. During this time he was instrumental in establishing a new level of credibility for officiating through the creation of a Referees' Association that provided services for all levels of hockey. Leo conducted at least one Referee Clinic per year including a session in Anchorage, Alaska. At home, his trainees served their apprenticeships at junior and senior practice sessions. Remarkably, Leo saw officiating as an educational tool rather than a hammer to discipline and enforce rules. He was often seen reffing "no glitz or glory games" in the cold open air of Bear Creek Park and instead of dishing out penalties he would stop the game and use an infraction as a teaching opportunity. "It was cold," said Leo, "but it was educational and fun." As a referee, Leo had the wisdom of Solomon to settle on ice disputes and in the process gained respect from the players. 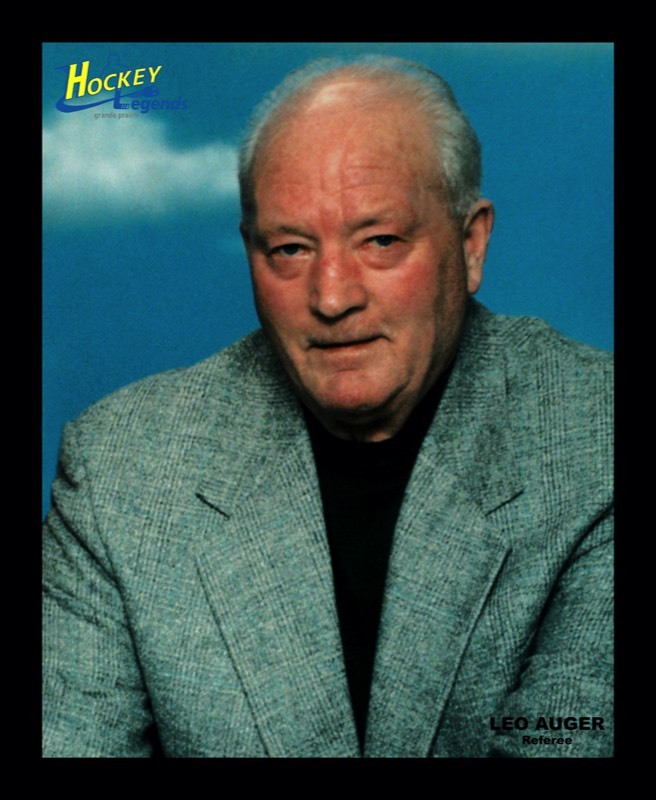 Leo Auger - a Grande Prairie Hockey Legend in 2004.